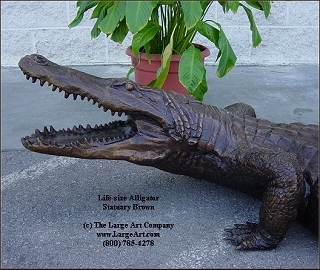 This is the best bronze alligator statue on the market. Made of pure bronze that will last for hundreds of years indoors or out. 14" tall x 88" long x 31" wide. Also available in a Verdi green patina. For a nominal fee we can weld mounting nuts under the sculpture for secure and permanent installations. We love to work with schools and Universities! Yes, we accept purchase orders. Note: We offer Free Shipping in the lower 48 states.